It's time again to join the Peanuts gang in counting down the days until Christmas, starting Friday, November 28, on the FiveCentsPlease.org home page. 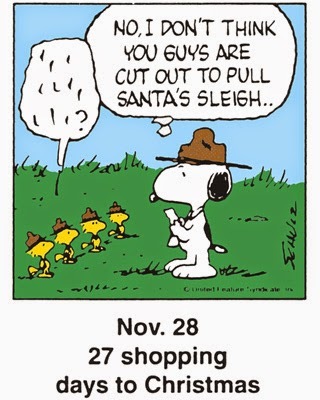 A different single-panel comic with a holiday theme will appear each day through December 25. Like the previous two years, we've visited the archives and selected a countdown from the past in order to continue this tradition. This time around we'll be featuring the panels from 1997 for your entertainment. We hope you'll visit our home page each day and enjoy these mini-comics with us as Christmas approaches.